Last night I tried loading multiple pictures in one post. I got fed up and decided today to try one picture at a time. It seems to work, but means that I have to do numerous posts to get one idea written. 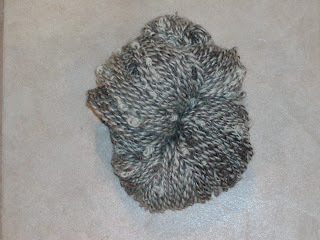 Anyhow, the above photo is a llama/mohair yarn with knots in it. Since I am goin gto the Pluckyfluff class in October, I figured that I shoudl start playing around with the novelty yarns that I already know. This and the coiled yarns are my favorites. It will be interesteing to see what I come out of the class liking the most.